Clarinet Gifts - Well, let’s start out practically. If you are buying clarinet gifts for your young clarinetist or mature clarinetist alike, you’ve come to the right place to start out. 5. Good accessories for clarinet (not required) – clarinet thumbrest cushion, clarinet neckstrap, clarinet mouthpiece cushions and clarinet peg. Clarinet Gifts - Buying a clarinet is somewhat complicated. Especially as a gift. Honestly, it is best to have the young clarinetist try a bunch of clarinets. A good place to get a handle on this is by reading the Clarinet Trail Chart. Clarinet Gifts - Clarinet reeds – Clarinetists ALWAYS need reeds. ALWAYS! I recommend they have at least one new box a month. Find out what reeds they play on and buy a few boxes. Remember, you need to have the proper reed strength that they play on at this point. Different reed companies have slightly varying scales as to strength. For instance, a Vandoren 3 reed might feel stronger or heavier (or harder to blow) than a Rico 3. For beginner students, buy 2.5 reed strengths. If they’ve played a little more than a year, buy strength number 3. Generally, by eighth grade (or playing 3 full years), they should play at least 3.5 strength or higher. Reed sizes go up to strength 5 and for many clarinetists 4.5 to 5 is too hard. I’m a professional clarinetist. I was playing strengths 3.5-4 through high school and have continued on those ever since varying brands and types. I play on the Vandoren Rue Lepic Reeds 3.5+ (yes these come in quarter strengths). I highly recommend these as they are the most consistent I felt per any box. One other brand I’ll recommend is the Rico Reserve Classic Clarinet Reeds. I’ve tried these recently and feel they offer a good quality product that produces a good refined clarinet sound. Clarinet gifts- Clarinet mouthpiece. If you purchased or received a clarinet and play the mouthpiece that originally came in that case, you are in for a big surprise. The dirty little secret is that most stock mouthpieces that come with the clarinet are horrible, usually very free blowing for the very, very beginner clarinetist. BUYING A GOOD QUALITY CLARINET MOUTHPIECE IS THE SINGLE BEST IMPROVEMENT YOU CAN MAKE IN SOUND QUALITY. So, if you are financially strapped and cannot afford a clarinet now, search for some good mouthpieces. Clarinet-Now.com is a good place to start. Understand there are many, many, many more types of mouthpieces. But, these are a good place to start. If you are buying or trying clarinets, mouthpieces, ligature or barrels, read the Clarinet Equipment RULE OF THREE page here. Clarinet Gifts - Clarinet ligature - This is the metal, plastic, leather or string part that holds the reed onto the clarinet mouthpiece. Again, the ligature that comes with the clarinet is very, very basic and functional at best. A ligature that holds the reed onto the mouthpiece but also allows the reed to blow freely is the ultimate goal. The standard clarinet ligature has the screws on the front of the ligature (on the reed side of the mouthpiece or as the clarinet is played, the screws are toward the chin). I’ve always preferred ligatures that are known as “inverted.” This means the screw or screws are on the back of the mouthpiece, facing away from the body. Again, I prefer the inverted type as I feel it is more free blowing. A really fine upgrade from the standard clarinet ligature (and affordable) is the BG L4R Revelation Bb Clarinet Ligature This is an inverted ligature. My students have had great success with this ligature and it is very durable. I also recommend the Vandoren Optimum Clarinet Ligature with Mouthpiece Cap. This Optimum ligature really plays well. However, I do not use it due to the large screw mechanism on the front end (reed side) of the mouthpiece. Clarinet gifts – The clarinet barrel. The clarinet barrel is the little piece between the mouthpiece and the upper joint of the clarinet. Again, on the priority list, you should follow exactly as I’ve written this page. If you cannot buy a new, quality clarinet; reeds; mouthpiece; or ligature first, don’t buy a barrel. However, if you feel settled in this equipment, an upgrade in a clarinet barrel is a good idea. Basically, the clarinet barrel will help you improve your sound and maybe have it play a little more freely. Here are some barrels I recommend you trying: Backun, Chadash, and Fobes. Clarinet gifts – Clarinet mouthpiece caps are always lost or missing, and they are VERY important because they protect the mouthpiece and reed. Anytime your clarinetist is not blowing, the cap should protect the mouthpiece and reed (on break, during a long rest, while walking from one area to the next, etc…). Clarinet gifts – The clarinet swab is probably the MOST important accessory you can purchase for your clarinetist. I recommend a silk swab. Condensation is going to build up in the clarinet and water gurgles in the tone holes while occur (especially the side Eb key or left hand Db key). Buying clarinet cork grease for your clarinetist is very important especially if they have a brand new clarinet. The corks help keep the joints of the instrument together. As they put the joints together, you with to lubricate the cork area with the cork grease. You can buy tubes of cork grease on the internet or your local music shop. Small screwdriver – The clarinet has a number of screws on it to hold the keys and posts onto the instrument. Very often, with wear and tear, the screws will come loose. A small “flat-headed” screwdriver is what you need to screw them back in place. Take caution though. Some of the screws should not tighten all the way down. If so, you will mess up the regulation of some of the keys. It is best to show the loose screw to your band director and have them show you which screws can tighten all the way down and which ones not. You will find this in your tool box or at the nearest hardware store. The screwdriver size is small enough to tighten a pair of glasses. If you really need to find a small flat-headed screwdriver on the internet, go to the Clarinet-Now.com search page. Music Stand – This is not really that hard to understand. Having a solid place to put your music is important while practicing. If you try to skimp on this and say, “awe, they can use another chair.” Well, for them to place music on a chair, they’ll have to crouch down to see the music. Poor posture does not help the development of a young musician at all. The music stand should raise high-enough that the student can look straight at the music. Again, the posture should allow the back straight, head and shoulders up. Metronome – The metronome is a time device. Basically, it helps the musician keep a beat. If you think of a stopwatch or the second hand on a clock, note that the click per second equals 60 seconds per minute. That, my friends, is also known as 60 beats per minute (bpm). So, do this. Look at your digital stop watch or the second hand on a watch or clock. Now, try this. Tap your foot or clap every time the second moves. Do this and keep try to make it work right with the movement of the digital seconds or second hand movement. You are using your standard time piece as a metronome. So, you’ve just clapped or tapped 60 beats per minute (bpm). If you were to clap at 120 bpm, you’d clap two beats per second. And, 80 bpm would sound somewhat slower than the 120 bpm. A metronome ranges from 42-250 bpm. Many pieces of music have a metronome marking or a musical description of speed at the top left corner of the page. Having students learn to play with the beat will help fundamental reading skills and allow them to play with other musicians better. Developing the proper rhythm is very important, and using the metronome as a tool do this will benefit your clarinetist greatly. Buying a cheap metronome is okay as they keep time and that is fairly simple to do. It is most important that your clarinetist have a metronome in their possession. Your Clarinet-Now.com "Best Bet" for metronomes is the Korg MA-30. If you wish to save the environment and never buy batteries, try this wind-up metronome by Wittner (and it is a nice little decorative wooden piece to display as well). A chromatic tuner is also extremely important for any musician. I prefer to have tuners that play pitches by to me to I can hear the tuner’s pitch and play the note. If I hear the dreaded “waves” in the sound, I know I have to do something to make it better. If you aren’t trained enough to know that, turn on the light device and the tuner will tell you if you are sharp or flat. If sharp, make your instrument longer at the barrel or middle joint to lower the pitch. If flat, push in at those spots to raise the pitch. If the instrument is all the way in at this juncture, you might not have warmed up the instrument yet. Nearly always, a clarinet will play flat when first put together. Allow yourself to “warm-up” before you play for the tuner. Again, the best way to practice with a tuner is to have is play the note at you and then try to listen to tune with that note. So many people look at a needle or light and think, “I’m in tune,” and then stop listening. Also, they think, “I’m right and everyone else is wrong.” Well, pitch is relative. Something you have to adjust higher or lower than you normally play to make a passage play in tune with other. Here are some great tuners that play pitches back to you. Alright, now, the most practical chromatic tuner you can buy is the Korg Chromatic Tuner CA-30. It has one note that will play back at you and that is A-440, but the digital needle will register any pitch that is played for it and give you a clear indication of whether you are Flat (b) or Sharp (#) on that note. Quik-Tune QT-12 has 12 reference notes to play back, only drawback is that does not cover the entire range of clarinet. However, is a good beginner, middle school tuner that will not break the budget. Metronome/Tuner – Having both of the above devices in the same tool is usually the best. I’ve always worn out the batteries of my metronome/tuners because of heavy use. They are not really that expensive. Check out this Korg Chromatic Tuner and Metronome TM40. Good accessories for clarinet (not required) – clarinet thumbrest cushion, mouthpiece cushions, clarinet peg and clarinet neckstrap. Clarinet Gifts - clarinet thumb rest cushions are good to buy and usually very cheap. Simply slide it onto the thumbrest for more comfort as the weight of the clarinet sits on the right thumb. Always have a cushioned thumbrest, but the next step to protecting the thumb is a clarinet neck strap. It is not required, but after hours and years of playing clarinet, overuse of the right arm can creep up. Again, this is not a required device, but if you ever hear of your clarinetist complaining about pain in the right hand, please consider this. Clarinet Gifts - clarinet mouthpiece cushions – These are small plastic or rubbers patches that are placed (with a peel-off sticky back) onto the top of the clarinet mouthpiece. This patch both protects the clarinet mouthpiece from getting “teeth divots” in the top of the mouthpiece and also from having the teeth slide around on the mouthpiece. First of all, if the teeth are sliding around on the mouthpiece, the mouth is not firm enough to play the clarinet properly. Second, if the mouth is strong enough to play clarinet properly, it will create the “teeth divots” in the mouthpiece. A benefit of the mouthpiece cushion is that it also helps your clarinetist “warm-up” their sound. Yes, this simple little device will help take some “brightness” out of their tone. 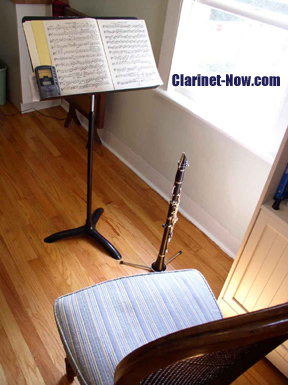 Another tip, order the small cushions for the Bb Soprano clarinets and large cushions for Bass Clarinet mouthpieces. Clarinet Gifts - The clarinet peg – The clarinet peg is a useful tool for setting the clarinet down, changing music, getting a glass of water, or just letting the hands rest for a bit. Many are collapsible and will fit in a clarinet case. Warning though, DON’T store the clarinet on the peg. Your cat, little brother or vacuum will certainly knock over your musical investment to no telling what problems: bent keys, broken mouthpiece, cracked clarinet, etc… But, again, do no abuse this and the clarinet peg will come in very handy. The Koenig Meyer Folding Clarinet Peg is what I use on a daily basis. The Clarinet Neckstrap - The clarinet is not that heavy, but add hours of practice a week, to months and years and overuse can apply to the right hand and arm of a clarinetist. Just think of all those people who have overuse problems with the mouse on a computer (that is not heavy, right?). The Claricord Neck Strap fits over the neck and onto any regular clarinet thumbrest. You can use this in conjunction with the clarinet thumbrest cushion which I wrote about earlier. Alright folks, because there is an endless amount of clarinet music on the internet, I'm going to offer a few selections below that are tried and true. If your clarinetist does not own these books or collections, start getting your hands on them. 1. 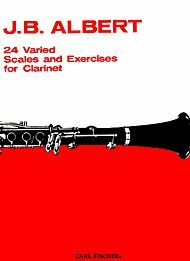 24 Varied Scales and Exercises by J.B. Albert This book is great for the beginner clarinetist through middle school. Some college clarinetists could even benefit from this book. 2. Method for Clarinet-Pt. 3 (Scales and Daily Studies, Op. 63) by Carl Baermann This scale book is for advanced players especially college, conservatory or graduate level playing. It is a mainstay of clarinet scale books. Clarinet method books are study (etude) books that your clarinetist might use to study extra lessons after school with their band or orchestra director, or with a Beginning Clarinet Book to get a better idea on this level of clarinet books. Opperman Intermediate Velocity Studies. This is a volume from my teacher's pen, Mr. Kalman Opperman. It is one of my favorite books to work with young and old students alike. Especially the clarinet trills on page 4 are worth their weight in gold. look inside Intermediate Velocity Studies (33 Technical Studies). Composed by Kalmen Opperman. For Clarinet. Instructional and Studies. Instructional book. Standard notation. 45 pages. Published by Carl Fischer (CF.O5433). Hite Melodious and Progressive Studies. Pretty studies that are easily approachable from an intermediate level. Klose Celebrated Method for Clarinet. If you want bang for your buck, this book offers 293 pages of easy to very difficult clarinet music and studies. It includes several clarinet duets that will keep your clarinetist and duet buddy busy for hours. Either or both the Rose Forty Studies for Clarinet or the Rose 32 Studies for Clarinet would be good choices in a clarinet study book. They offer alternating type studies from a beautiful slow study to the fast and flashy study. 16 Grands Solos for Clarinet and Piano edited by Daniel Bonade. This includes the Weber Concertino and the Messager Solo de Concours. Masterworks for Clarinet and Piano edited by Eric Simon. This includes six works by master composers and probably the best collection of the best clarinet solos in the world. It includes Weber's Grand Duo Concertante, Op. 48; Schuman Fantasy-Pieces, Op. 73 (for Bb and A clarinets); and the two Brahms Sonatas, Op. 120, No. 1 and No. 2. Now, as you see above, I've included scale books, method books and classical music collections. Remember, clarinet plays jazz, dixieland and klezmer, too. 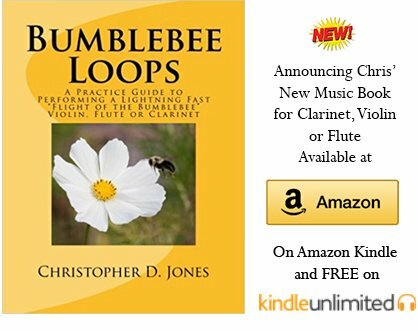 I'd recommend you buy one "method" book and another fun "popular" book either you or your clarinetist would love to learn. For instance, what is your favorite movie, Broadway show or TV show? Look up that show and see if anything has been arranged for clarinet. Also, who is your clarinetist's favorite pop artist? See if one of their solos has been done up for clarinet. Well, you can find about anything regarding the clarinet on a piece of fabric or paper. One thing is for sure, you can't just find a clarinet t-shirt in the local mall or department store. From the time my parents got me a clarinet t-shirt in New Orleans, I've loved wearing clarinet related gear. Often, I'll get a cashier saying, "I used to play clarinet." And I'll say, "Oh yeah, when?" And it is usually, "in sixth and seventh grade, but I quit." So, remember this. Encouragement for your clarinetist it the greatest gift you can give them. Good instruction is next. Then, good equipment. After that, a clarinet t-shirt isn't too bad either. Or, how about clarinet shoes (Ha Ha).